Few days back our team received Green Kohl from VLCC and I really felt happy and took no time to say I want Green for my eyes. I have been testing out the Green Kohl for a while and I am going to tell you my experience of using the VLCC Enchanting Eyes Green Kohl. The kohl is a twist up version with an attractive eye catching packaging. The kohl has its name on the kohl. The back cover of kohl is superbly interesting showing different looks that one can create with the kohl. Also, there is a colorful tape stuck on the top which mentions the color scheme. Beautiful forest green colour which looks appealing on the eyes. It looks to be a matte eye liner when applied to the eyelashes. 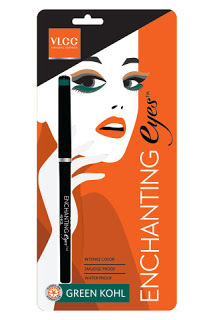 The color looks gorgeous on brown eyes and also makes black eyes stand out because of the deep emerald colour. Texture: I would say it is a super creamy one as in a go I was able to put a consistent line on my eyes. This does not tug or pull the eyes, which is great. Pigmentation: Even a single swipe gives a fine effect on the waterline and the eyelids. What else? The pigmentation is really fine and reasonable, not bad at all! Longevity:The longevity is not a wow here. I have nothing but praise for the lasting power. After 3- 4 hours it started smudging on my eye-lids. However, I have oils eye lids but again it also ended up transferring on to my crease area after three to four hours I hope on normal lids it would stay for 7-8 hours easily. Quality: Considering the results delivered it emerges as a great kohl in the affordable cost. The colour is too good for the smokey eyes. The Green Kohl is must a refreshing twist on the traditional black kohl and must have an accessory in the makeup kit.